Dario Hidalgo, director of Research and Practice for EMBARQ (the producer of this blog), met with Bangalore transit officials on improving city bus services. Photo by Kalyan Kanuri. 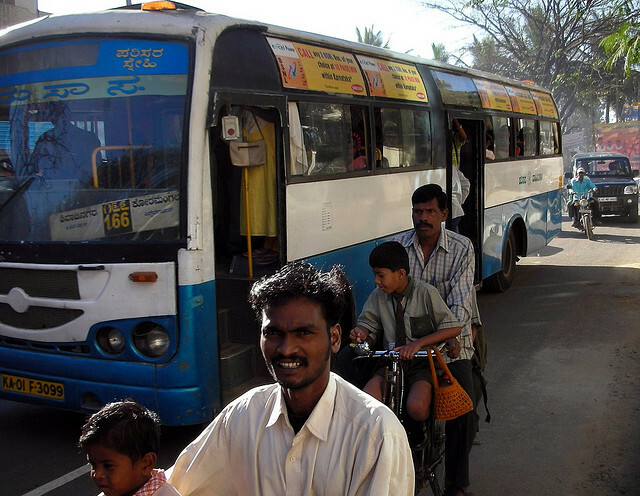 EMBARQ Director of Research and Practice Dario Hidalgo and an EMBARQ team trained Bangalore Metropolitan Transport Corporation Officials (BMTC) on improving their BIG-10 city bus services. Ireland’s capital city of Dublin has opted for developing four bus rapid transit (BRT) corridors instead of a previously considered 25-kilometer light rail system. The three-day Latin American Carbon Forum was held this week in San Jose, Puerto Rico. Washington State’s King County Metro Transit will debut its second of six planned BRT lines this weekend. The three-day 7th International Congress on Sustainable Transport, hosted by EMBARQ’s Center for Sustainable Transport in Mexico (CTS-México), begins this Tuesday in Mexico City. The New York City Metropolitan Transportation Authority announced that damage caused by Hurricane Irene to a rail line in Orange and Rockland county will cost $50 million to repair. A new accessible pedestrian crosswalk signal was installed in New York City. Twenty-one city intersections feature these audible signal fixtures, and plans call for 25 more in the coming year. OPAL advocacy group is challenging current Portland TriMet fare-card policies on grounds of potential economic inequities. The Earth Advantage Institute, a not-for-profit green building resource, has embarked on an Eco Neighborhoods pilot program to rate and certify the sustainability of neighborhoods. The program is currently accepting Expressions of Interest (EOI) from those interested in participating. The World Health Organization released the results of a global city air pollution survey, which found that cities in Iran, India and Pakistan are among the worst on the planet for air pollution. Comprehensive standards for universal electric vehicle (EV) plug-in charging facilities were defined by European automobile manufacturers, with the support of the European Automobile Manufacturers’ Association. Sixty clean energy technologies research projects were awarded a combined $156 million in funding from the U.S. Department of Energy’s Advanced Research Projects Agency-Energy (ARPA-E). A new, free Dutch iPhone application, “Fueless,” was released, offering users audio and visual feedback while driving to save fuel consumption. The winners of the 4th Active Cities, Healthy Cities competition were announced this week. The competition, organized by EMBARQ Brazil, recognizes projects that promote health, safety and sustainable approaches to urban living and transportation in Latin America. Abu Dhabi police announced that the number of pedestrian deaths in the capital city has decreased by a third in the first eight months of this year, as compared to last year. A subway train collision in Shanghai, China resulted in the hospitalization of 271 individuals. Thankfully, no individuals were killed in the crash. South African police forces have removed more than 1,500 “un-roadworthy” buses and taxis from country roads in efforts to improve road safety, as part of its National Rolling Enforcement Plan. Open Streets will be held on State Street in Chicago’s Loop this Saturday, October 1. The 10th annual Tour de Troit bicycle ride was held in Detroit, Michigan last weekend. The group ride included roughly 4,500 riders and raised funds for city bicycling infrastructure.